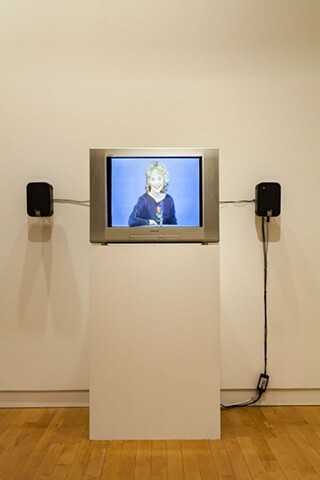 Birnbaum manipulates off-air imagery from the TV game show Hollywood Squares in Kiss The Girls: Make Them Cry, a bold deconstruction of the gestures of sexual representation in pop cultural imagery and music. Minor celebrities (who Birnbaum terms “iconic women and receding men”) confined in a flashing tic-tac-toe board greet millions of TV viewers, animating themselves as they say “hello.” Birnbaum isolates and repeats these banal and at times bizarre gestures of male and female presentation—“repetitive baroque neck-snapping triple takes, guffaws, and paranoid eye darts”—wrenching them from their television context to expose stereotyped gestures of power and submission. Linking TV and Top 40, Birnbaum spells out the lyrics to disco songs (“Georgie Porgie puddin’ and pie/kissed the girls and made them cry”) with on-screen text, as the sound provides originally scored jazz interpolation and a harsh new wave coda. The result is a powerful, layered analysis of the meaning of the gestures of mass cultural idioms. “Yellow Bird”: Spike and Allan Scarth. Vocals: Dori Levine. Audio Mix: William and Allan Scarth. Technical Assistance Thanks: Nova Scotia College of Art and Design, Fred McFadzen/Ed Slopek, Exploring Post #1, Ted Estabrook, Halifax Cablevision, Bruce Nickson, Madelaine Palko. Soundtrack: “Found a Cure,” Ashford and Simpson, “Georgy Porgy,” Toto. Television Footage: “Hollywood Squares.” Aired in NY on CBS/NBC.